Seafile is a powerful cloud storage and data synchronization program for Windows. You can easily store your data on a central server and then synchronize it with your systems and mobile devices using Seafile client. The online storage application works by synchronizing your data between Seafile’s servers and the client apps installed on your PCs, tablets, and smartphones. The interface of this Windows software is so intuitive and user-friendly that even a novice can easily work on it. The file transfer utility synchronizes your data while maintaining its privacy. The only thing you need is to set up an account with the service to use it. Seafile’s full version allows you to create libraries from where you’re able to upload and organize your various types of files. You’re allowed to sync each library separately if you want. A library can also be encrypted with a password chosen by you. Seafile for Windows enables you to create groups so that you can simply share your large collection of data into groups. The program also comes with a full version control mechanism. The file synchronization tool for PC is a secure solution to your data storage problems. The client side encryption provides you a strong and robust cloud storage system. The file encryption is done on the client side and no passwords are sent to the server. The passwords are not stored on the server; therefore, the admin is not able to view your content. You can protect your files/folders by encrypting them and accessing them with a password. Download Seafile today to start storing and sharing your files with others without any difficulty. 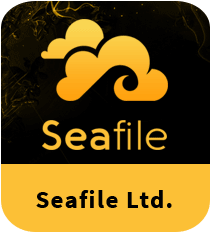 Seafile is an open-source cloud storage application that is designed to synchronize your data and let you share them with your friends or business partners. The Seafile client app is available for Windows, Mac, Android, Linux, and iOS. In addition, you’re able to access your content stored in Seafile servers using a web interface. Overall, the software features many options and the main app window displays all the details about the data available in the cloud.